I have a good collection of Rollei filters, Bay I, Bay II and Bay III. If I missed anything, please let me know. Thanks. For B&W photography only, it does not work fine for color photography because it has a color tint, this filter has a strong effect to block UV rays, it’s very good for high mountain, snow, water surfaces, high and distant landscapes. is soft. It may not work fine for high mountain, snow, water surfaces, high and distant landscapes. It is used when distance view is hazy. It renders red lighter, blue-green darker. Gives stronger effects than orange filter. This color conversion filter has an UV filter effect and slight color warming effect for Tessar and Xenar lenses, it does not have UV filter effect for Xenotar, Planar and Sonnar but it has slight color warming effect for these lenses. soft warming effect for every Rollei TLR lens. 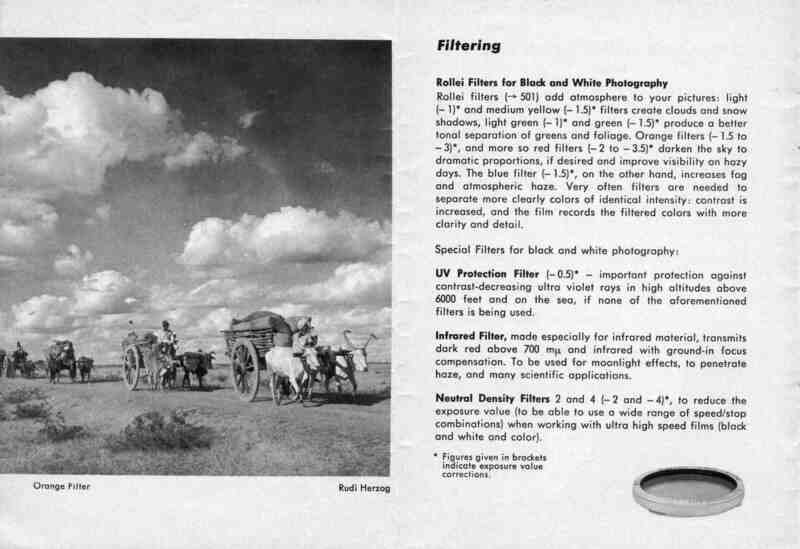 This filter was manufactured from 1957, after R1, R2, R5 and R11 color conversions filters were no longer manufactured (1966), it would be equivalent regarding a Skylight 81 A or B filter. 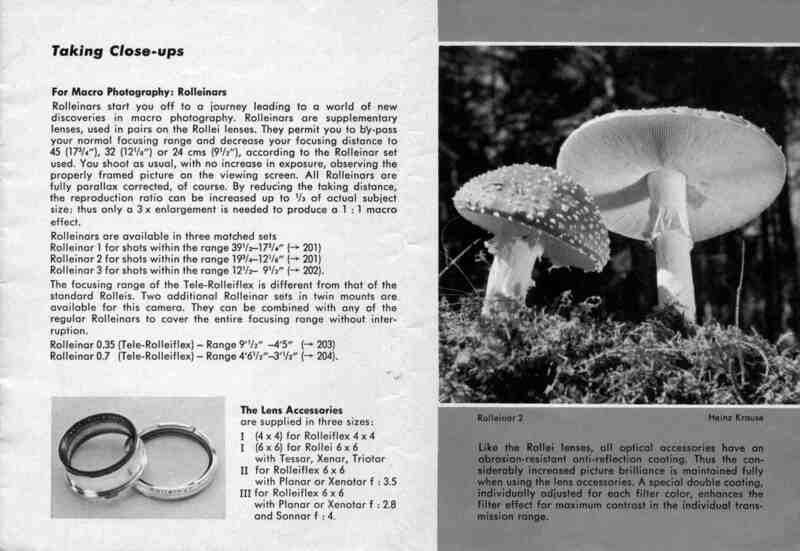 Use: With the two Rolleinar sets 1 and 2, the Rollei is converted for a focusing range from 39 1/2–17 3/4 (18 1/2) in. and 19 3/4 –12 1/8 (12 1/2) in., see page a. Each set is composed of two optically matched frontal lenses with different mounts. The Rolleinar with the thicker mount is for the viewing lens (Heidasmat) and contains a built-in prism for parallax correction. As a result the field of view in the ground glass coincides with the photograph even at very short distances. A red dot an the mount indicates the uppermost side of the lens for correct positioning in use. The same instructions apply to the Rolleinars with bayonet size I (see page 2) using a separate Rolleipar parallax corrector for each set. Here too the Rolleipar is always attached to the viewing 1ens Rolleinar red dot up. Focusing is accomplished as usual an the ground glass screen. The depth of field being rather limited at close range, considerable stopping down is advisable with Rolleinar lenses. The depth of field table indicates the most advantageous stops for the 25 1/4 X 2 1/4 – and 1 X 1 1/2 inch size. The advantage of a large reproduction should not mislead to indiscriminate shortening of the camera-to-subject distance with close-ups, as this practice would entail danger of distortion. It is less great with objects having a shallow depth of field. For the same reason portrait heads should, if possible, not be taken at distances closer than 40 in. 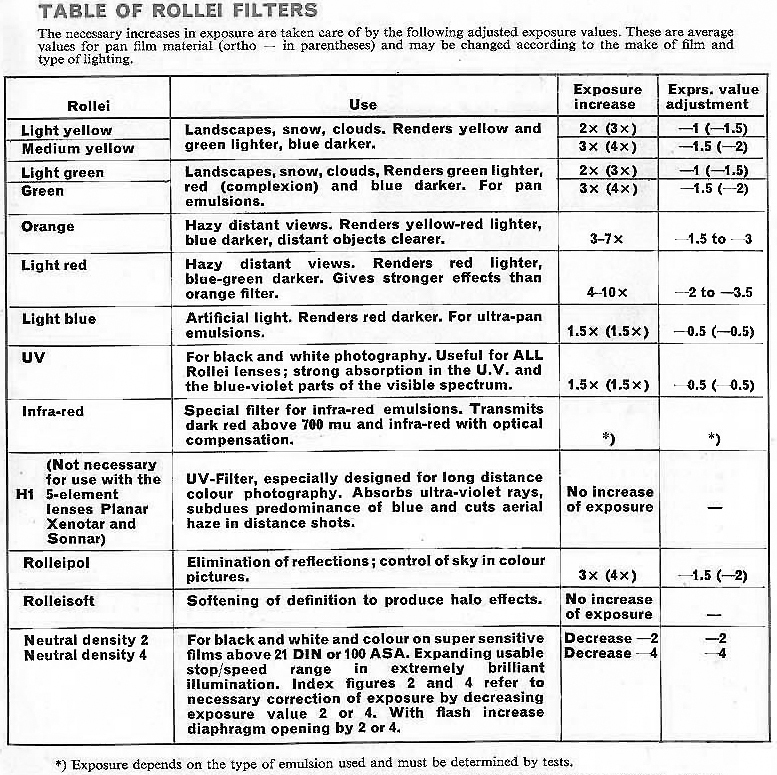 Rolleinar Lenses require no increase of exposure. To install: First attach the taking lens Rolleinar and then the viewing lens Rolleinar with prism in front. Insert into the inner bayonet and turn to the right until they click into position. The red dot on the viewing Rolleinar must be up. Distances are measured from lens board to subject. The figures given in the tables are, for all practical purposes, usable with both 75 and 80 mm. lenses. Permissible circle at confusion = approx. 1/1000 of the focal length at 75 and 80 mm. respectively. * Figures given in parenthesis apply to a focal length of 80 mm. 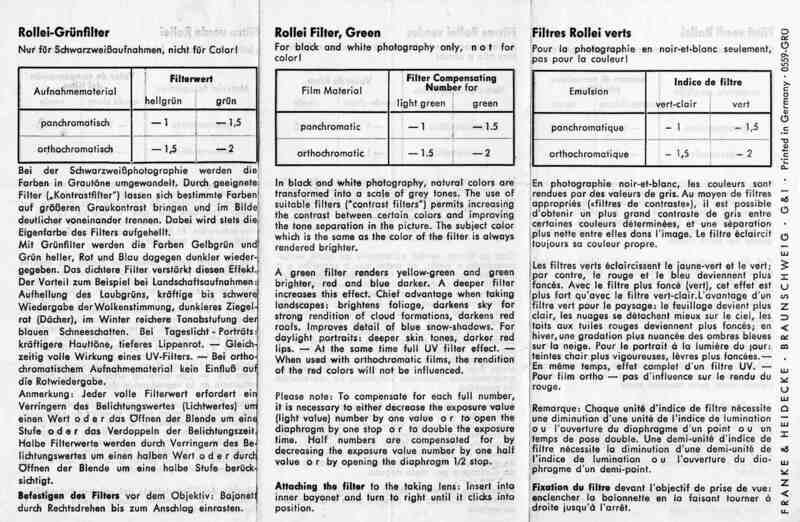 Rolleipol can be used for both color and B&W films. Purpose: Elimination or subduing al disturbing reflections (glare) from shiny, non-metallic objects or surfaces. Under certain conditions, filtering of the blue sky. 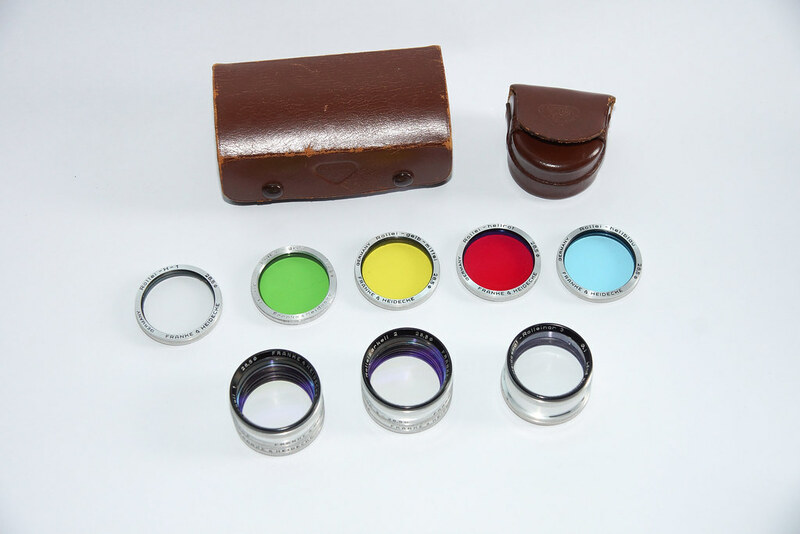 Especially useful for regulation of the colors (colored reflections) and control of sky tone in color pictures. Explanation: If the direction of movement of a light beam is imagined to be the axle of a wheel, then the spokes of the wheel correspond to the various plans of oscillation of the light waves (i.e., we are looking at the light beam in cross section). Polarization will reduce the many planes of osculation to merely one. Polarization takes place when light waves, striking at a certain angle, are reflected by shiny bodies (with the exception of metals). This polarized segment of light can be retained in full or in part by placing the Rolleipol filter across the plane at oscillation: the reflections disappear. (The filter itself has a polarizing effect an the light which passes through it.) 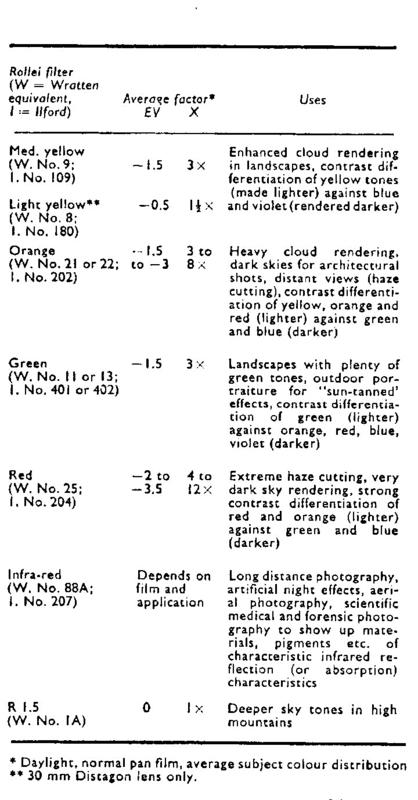 Further, since there is also polarized light in the blue sky, this can be eliminated: the use at the Rolleipol filter results in subdued (darkened) sky portions. Not all reflected light is polarized. If reflections are to be eliminated, 1, the filter must be turned (an its optical axis) in the direction of the vibrations as required, and 2. the camera position must be changed to gain the best effect. This is attained when the beam of light striking the reflecting body and the line of camera view farm an angle at 60–74′, (varies according to material at the subject). Application: 1. For eliminating or subduing disturbing reflections when photographing reflecting objects (polish, porcelain, painted and lacquered finishes, etc., — reproduction of textures and material), when photographing glass surfaces and the surface of water (the reflecting surfaces became transparent), 2. for filtering sky when photographing landscapes: the blue sky is darkened by absorption of the polarized light it captains. The effect may be observed in advance by looking through the filter. Light value correction about –1.5 = increase at exposure about 3 X. It is used for portraits in artificial lights: against too pale lips, filter for hypersensitized pan film with artificial lights. Purpose: Softening of super-critical definition producing striking fluffy halo-effects, especially with back-lighting. 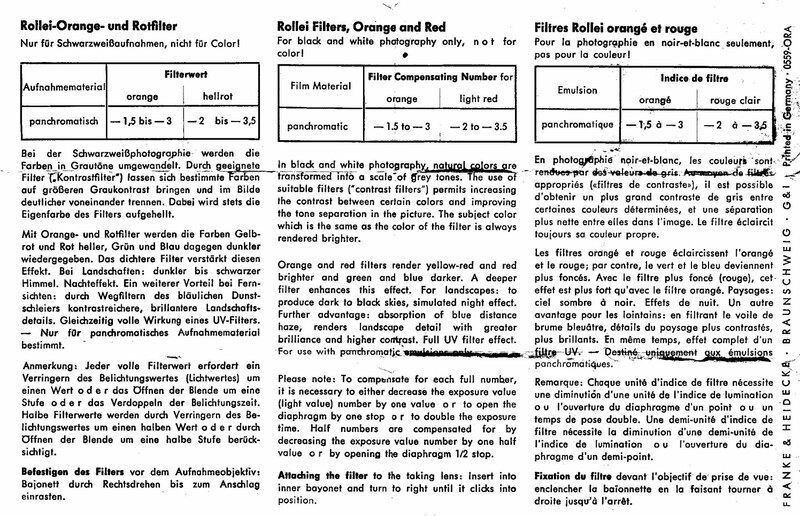 Explanation: The taking lens Of the Rollei gives super-critical definition required for the majority of exposures. If, occasionally, softer definition is desired (e. 9. for portraits and certain dramatic effects) this is obtained by attaching the Rolleisoft Soft Focus Lens in front of the lens. The Rolleisoft lens consists at a plane parallel glass disc with a few concentric ground-in grooves. 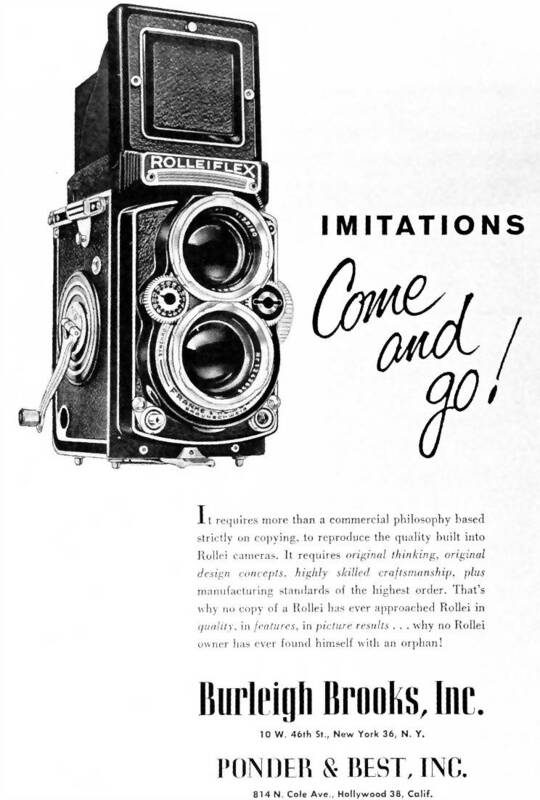 While otherwise the lens permits only sharpness or softness through adjustment of the focus, the Rolleisoft lens obtains both simultaneously: Between these grooves the rays of light pass unimpeded to the film and produce a sharp impression, i. e., the basis of the image. At the grooves, however, the light rays are diverted with the result that an additional image of slightly softer definition is superimposed. Both together produce the soft focus effect: The exposure shows fluffy softened contours and sunny halo-lights; distracting fine details recede and the fatal impression of depth definition is improved. By means of the Rolleisoft the Rollei-lens becomes a soft focus lens. Application: Best results are obtained by using the entire surface of Rolleisoft, i. e., with full aperture. With Rolleisoft 1 (with increased number Of grooves) it is permissible to stop down to f: 5.6. Smaller apertures tend to decrease the soft focus effect. Rolleisoft 0 is used for weak soft faces effect: primarily for strong contrasts of light and glittering objects, i. e., chiefly for backlighted subjects. Rolleisoft t is used for greater soft focus effect: for soft lighting. — Chief field at application generally: portraiture. Best suited tar: contrasting, highlighted subjects. Rolleisoft increases the plastic, sunny character of backlighted pictures. Speed and focal length remain unchanged. Generous exposures increase the halo-effect. The ground glass screen shows full focused sharpness when using Rolleisoft lenses. The Rolleisoft effect can be judged at any time an the ground glass screen by placing the Rolleisoft in front of the finder lens. For Use: Fasten Rolleisoft to inner bayonet at the taking lens. It is for B&W photography only. Not for Color films. A green filter renders yellow-green brighter, red and blue darker. A deeper filter increase this effect. Chief advantage when taking landscapes: brightens foliage, darkens sky for strong rendition of cloud formations, darkens red roofs. Improve detail of blue snow-shadows. For daylight portraits: deeper skin tones, darker red lips – at the same time full UV filter effect – when used with orthochromatic films, the rendition of the red colors will not be influenced. Medium yellow filter often is used for b/w outdoor photography to provide contrast between clouds and sky. Filter facter -1.5 = -2/3 stop correction. When metering, set your handheld meters for film 2/3 stop slower than loaded, e.g. 100 speed to 64. You also can use it with color film to simulate late afternoon, though you need to experiment a bit. It is a special filter for infra-red emulsions. It transmits dark red above 700mu and infra-red with optical compensation. You can only use it with infra-red film, which is expensive and hard to find. Visually, this filter looks opaque. 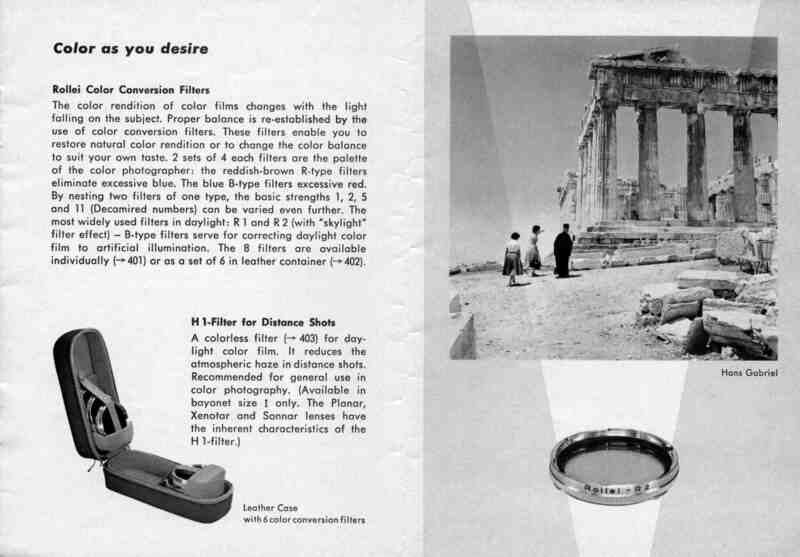 It is used for black and white and color on super sensitive films above 100ASA. Expanding usable stop/speed range in extremely brilliant illumination. Index figures 2 and 4 refers to necessary correction of exposure by decreasing exposure value 2 or 4, or with flash increase diagram by 2 or 4. An excellent write-up, and provides very good information for the user. 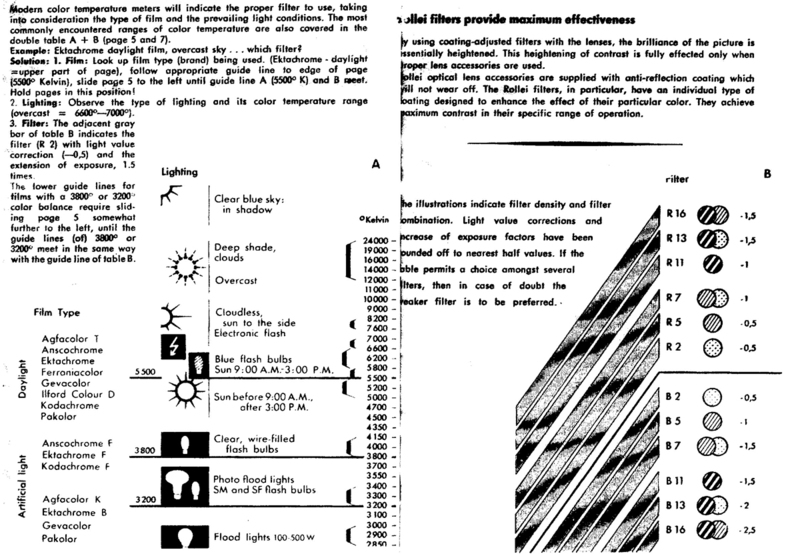 I would like to ask if there is any experience in using two UV protection filters, e.g., Heliopan at the same time – one filter mounted each on the taking and viewing lenses, simultaneously. I tried this and learn that the bayonet design does not allow such a combination, and is quite a design limitation in an otherwise well designed camera. I also read that it is not necessary to protect the viewing lens – I prefer to protect both lenses – my preference. Could you please write any experience from your side on this feature. Thank you and best regards. I thought it is not a problem to install two UV filters on both lenses? which camera are you using? I apologize for the delay in replying. I use the Rolleiflex 2.8F Planar (12 exposures). How can I tell if a filter has the right bayonet setting? they might have different factors for different sizes of the yellow filters. usually it is marked on the filter it self. sorry for the late reply. Thanks so much. I’ve been looking for information like this and this is just perfect. You know what you’re saying and say it very well. Thank you again. Good information for the user and the buyer.